The academic conference recognises the important role played by early stage researchers on topics connected to the theme. We encourage interested participants to attend and/or present under one of the sessions. Participants will gain feedback from scholars to help them publish their work or complete their MA theses. 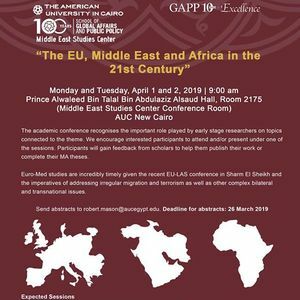 Euro-Med studies are incredibly timely given the recent EU - LAS conference in Sharm El Sheikh and the imperatives of addressing irregular migration and terrorism as well as other complex bilateral and transnational issues. Send abstracts to cm9iZXJ0ICEgbWFzb24gfCBhdWNlZ3lwdCAhIGVkdQ==. Deadline for abstracts 26 March 2019.